How Many Irish Traditions Do You Actually Know? 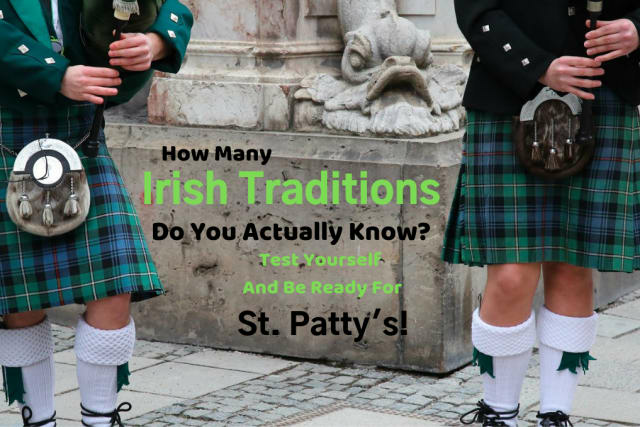 Test Yourself & Be Ready For St. Patty's! St. Patrick's Day is almost here but there are plenty of other Irish traditions you should know about. Test your knowledge of Irish traditions with this quiz. What Irish Saint is honoured with his own holiday every year on December 26th in Ireland? This day marks the beginning of Spring in Ireland and many farmers ask this Saint of dairy and cattle for blessings. This popular Irish holiday began in the 1950s to honor the famed Irish novelist, James Joyce. It is held on June 16th to coincide with the day Ulysses was released. The famous ballet, Swan Lake, is said to have been based on this story from Irish mythology. Tír na nÓg is an outer world universe from Irish mythology. According to Irish lore, what will the inhabitants of this land never do? The Irish holiday of Samhain is similar to Halloween. Instead of pumpkins, however, Samhain celebrators would carve faces into these. Although it has mainly died out, some in Ireland still celebrate this holiday on January 6th. Often referred to as "Women's Christmas", this day involves the women taking the day off but the men still working. In addition to the color white, it is also acceptable for brides in Ireland to wear this color. Put some green food colouring in your beer and celebrate!